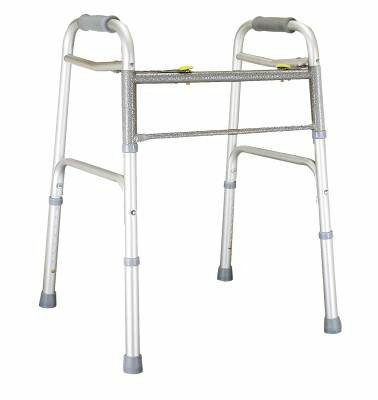 MediChoice's Bariatric Dual Release Folding Walkers are made with durable anodized aluminum tubing that's both strong and lightweight. A dual-release mechanism makes folding the walker easy for users with limited dexterity. The walker is appropriate for users up to 600 pounds that stand between 5 foot, 4 inches and 6 foot, two inches tall. Precise positioning is possible via the eight adjustment positions, which range from 31 to 38 inches. MediChoice is Owens & Minor's brand of medical-surgical products and durable medical equipment that is expanding to meet the changing needs of healthcare. MediChoice, your choice for quality, value and unmatched service. Search MediChoice for additional product offerings.